North Java coast is the best place for Chinese culture acculturation. You can see from cities such as Batavia, Gresik, Tuban, Madura, Semarang, and Cirebon. At least there is other culture beside Chinese that give those city “the colour of life”. There are four big groups In Batavia: Betawi, China, Arabian, and Europe. 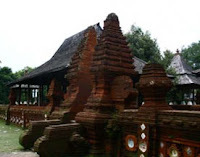 You also can see those culture in Cirebon. Cirebon is not only name without history. 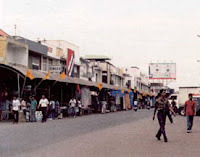 The name Cirebon is come from the word ‘Caruban’ means place to meet or intersecting street. Some said Cirebon is come from the word ‘carub’ in Javanese means mixture. By Tome Pires, the word “caruban” was recorded as Choroboarn and because of the Sunda influence which always have “Ci-“ prefix (means water), then the name was changed became Cirebon (Ci=water and rebon=Shrimp), Shrimp river. You can see it from the souvenir. Always made from shrimp, whether the food or handicraft. There’re only few Indonesian people make Cirebon as a tour destination. Whereas, this city has lots of tourists area, especially for the historical relics and the food. At least, there are 10 foods which difficult to find, available in here. At Jamblang, there are lots of buildings in lines with Chinese style still exist. Those buildings now become the place to sell or workshop. But basically, all of those buildings seem to be sleazy. This area was lengthwise just like the watercourse. A note at one of the old buildings wall at Jamblang inscribed 1833. There’s possibility the most expansion going in early 19 century. There are Three keraton (kingdom) at Cirebon and they are brothers. We tow the story about Keraton after saw the Gunung Jati cemetery. Gunung Jati was the name of Sunan (title for the holy men who first brought Islam to Java) titled Gunung Jati, and his real name is Faletehan or Syarif Hidayat Fatahilah. He is a Chinese muslim. Later, the established of sultanate at Cirebon is his interfere. At the end of Demak kingdom, Chinese settle at the north java coast is improving quite big. Most of them came from Yunnan and their religions are muslim. One of the famous Ulama(Muslim Scholars) was Haji Tan Eng Hoat. He was the one who lead Fatahilah to establish the kingdom of Cirebon. Thereby, the Sultanate of Cirebon in 1522 established by Haji Tan Eng Hoat otherwise called Mohamad Ifdil Hanafi together with Sunan Gunung Jati. Sunan Gunung Jati become the first king for Kasepuhan. And then in 1553, Sunan Gunung Jati married the daughter of Haji Tan Eng Hoat, Ong Tin also known as Princess Chinese. We can find their graves at Gunung Jati funeral. The funeral called Wukir Sapta. It’s pretty good, surrounded by white wall with Chinese porcelain. Back to Keraton! There are three big Keraton, Kasepuhan, Kanoman, and Kacirebonan. Two of them were Chinese–Java architecture (Kasepuhan and Kanoman). While Kacirebonan has Europe architecture (Indische). Jus like Java Keraton, these three Keraton were facing to the North complete with hall and mosque at the west side. Keraton Kasepuhan has holy mosque : Agung Sang Cipta Rasa, also become the sunan Gunung Jati cemetery. Keraton and the other support facilities, such as mosque, Regol, and Pendopo have hundreds of Chinese ornament, such as porcelain, furniture, and jewelry. In this area, the guide will welcome mat you. You can listen to the guide about history and add your insight. Do you love shopping? 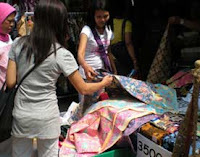 Here you go : Batik pesisiran had a great vogue in this city. An area called Trusmi, Plered, dedicate itself as the batik producer in central java. Start from di Jln. Panembahan and Jln. Buyut Trusmi. There are two kind of Cirebon’s batik : Batik Pesisir which influence by Chinese and Batik Keraton which influence by Hindu and Islam. Motif of Batik pesisir marked with the picture of flora and fauna, such as fish, trees, and leaves. While batik keraton motive marked as ornament such as stones (wadas), kereta singa barong (Lions train), naga seba (Dragon Seba), taman arum (arum park) and ayam alas (Chicken alas). There are many other things you can search in Cirebon. This small city was ever be the center of economic development in java. Cirebon with the three culture, Cirebon with three keraton. My friend recently comes back from Batavia. He shared his great experiences last night with me. Your full blog is related to his views. Now I am wishing to visit North Java coast soon.